I love the colour of this bird's feather. I had a bit of a problem with the background - I original had a lighter blue / grey background colour but the bird was looking lifeless so I ended up changing it to Burnt Umber. Much happier with it now as the bird now stands out from the background. These birds breed in the coastal South-east and in the South-central of the United States. They measure around 12 - 13 cm and weigh between 13 - 19 grams. 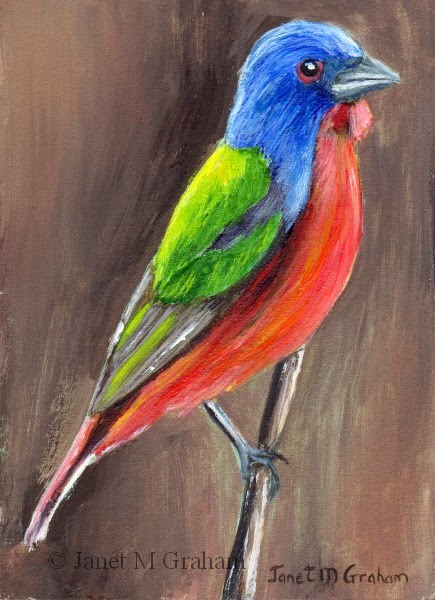 Painted Bunting measures 2.5 x 3.5 inches and is painted on 300gsm smooth Arches watercolour paper. This one was fun to paint. Love how he is perched on the tree stump. Rufous Whistlers are found around Mainland Australia as well as in New Caledonia. They measure around 16 - 18 cm and weigh about 25 grams. So this is the full bird painted in watercolours. I just love this birds feather colours and I am really pleased with the final painting. I went with the 8 x 6 inch size in the end. I still want to paint another Carmine Bee - Eater but I will paint it in acrylics. 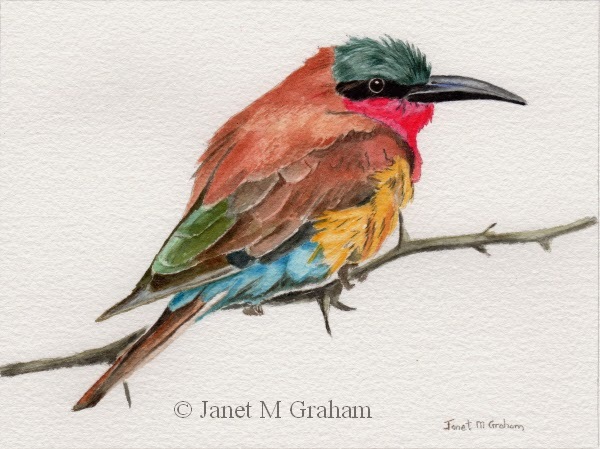 Carmine Bee Eater measures 8 x 6 inches and is painted on 300gsm rough Arches watercolour paper. I have wanted to paint a lorikeet for ages and I just love the position this one is sitting on the log. They are actually one bird that I often see around my suburb and they are a regular visitor to my garden - I am just never quick enough to grab my camera and get a good photo of them. They measure are around 28 - 32 cm's in length and weigh around 133 grams. 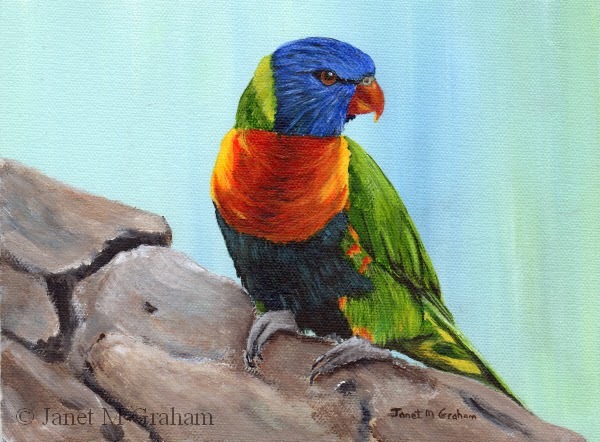 Rainbow Lorikeet measures 8 x 6 inches and is painted on Raymar's Feather Light Smooth Portrait Cotton 1/16" panel. This cottage scene reminds me of Tasmania. I have visited Tasmania in March when the trees are starting to change colour and it is really beautiful. It is one thing I miss living here in Brisbane as we don't get to see the trees change colour. 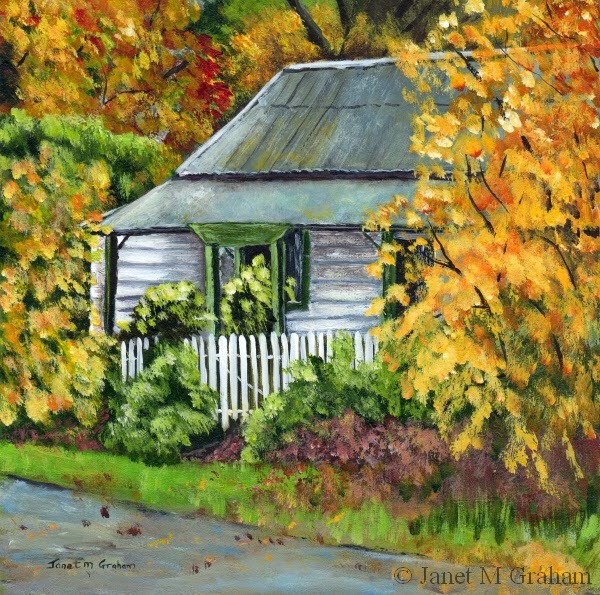 Autumn Cottage measures 6 x 6 inches and is painted on Ampersand Gessobord Panel. I love painting these birds - I just love the colours of their feathers. Everything just worked with this one and I am really happy how the final painting turned out. An interesting fact about these birds is that their favourite insects to eat are bees and they will rub the bee against their perch to remove the stinger even though they are immune to the bees sting. 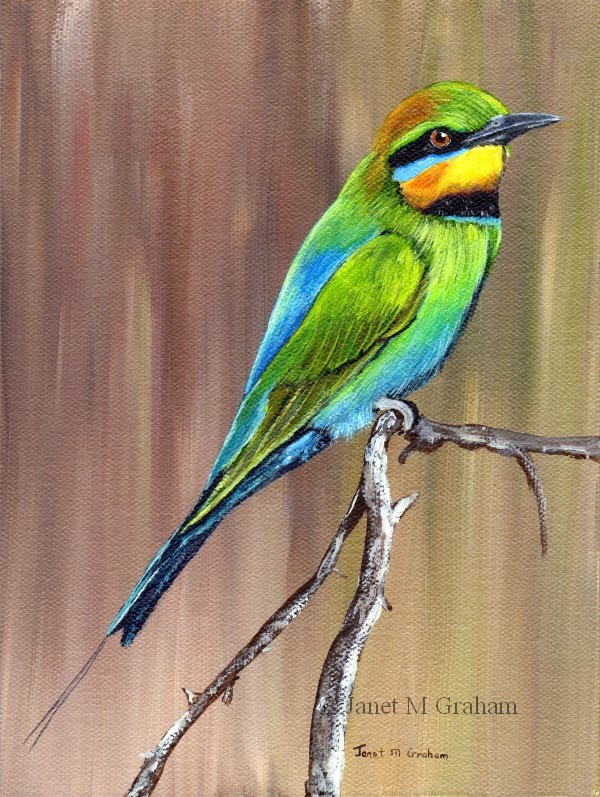 Rainbow Bee - Eater measures 6 x 8 inches and is painted on Raymar's Feather Lite Smooth Portrait Cotton 1/16" panel. I couldn't decide on which medium to paint this lovely bird in. I was going between acrylics and watercolours. In the end I decided to do a watercolour head study in order to get an idea on how it would look in watercolours. I was really pleased with the result so I will be painting the whole bird in watercolours. Of course I still want to do an acrylic version. Fortunately I have two more reference photos with the same bird but with its head at slightly different angles. So I can paint an acrylic and I am also think an oil version. Carmine Bee-Eaters are found across sub-equatorial Africa ranging from KwaZulu - Natal in South Africa across to Namibia and Gabon, the Eastern Congo and Kenya. 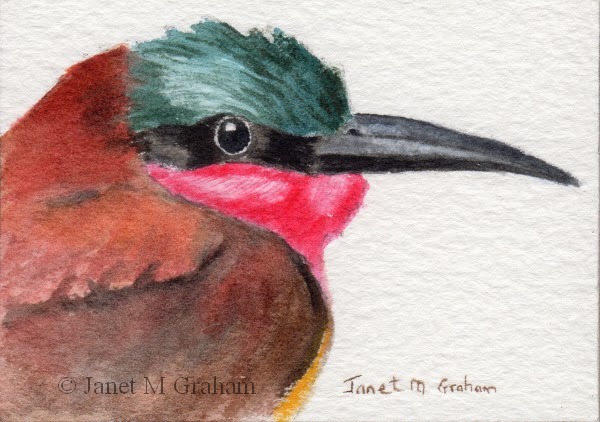 Carmine Bee - Eater measures 3.5 x 2.5 inches and is painted on 300gsm rough Arches watercolour paper. I felt like a change so I decided to paint the sea.. I bought a DVD tutorial a while back on painting the sea / wave in moonlight and have been wanting to paint my own version for a while. I went through my photos from my holiday to the Bay of Fires in Tasmania a few years back and found one that was suitable. I just printed it out in black and white. I used Prussian Blue, Phthalo Blue and Ultramarine Blue for the wave - it worked rather well. 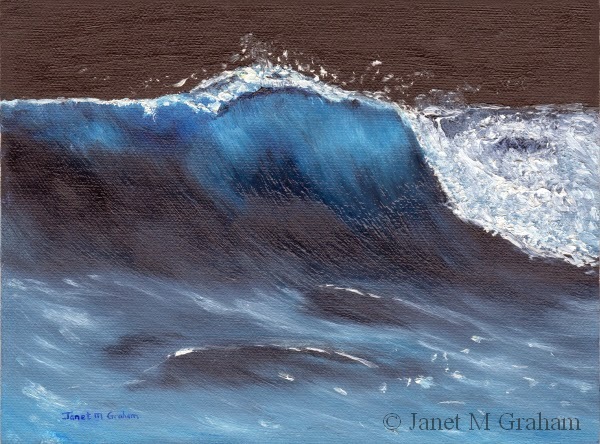 Moonlit Wave measures 8 x 6 inches and is painted on Raymar's Feather Light Smooth Portrait Cotton 1/16" panel. I have had this one on my list to paint for ages. Love the intensity of the eyes. I actually started it, wasn't happy with how it was going and to put it one side. About two weeks later, I relooked at it and worked out that my fur colour was not quite right which was throwing off the whole painting. So I reworked the fur and finally the painting come together. Really pleased with the final piece. 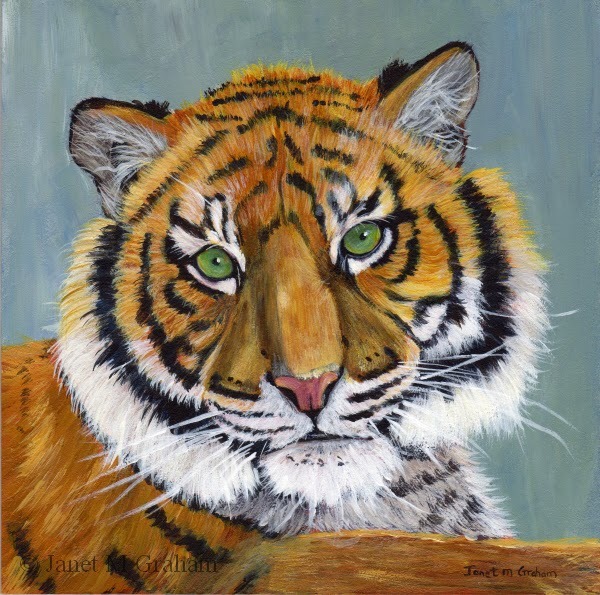 Tiger measures 6 x 6 inches and is painted on Ampersand Gessobord Panel. 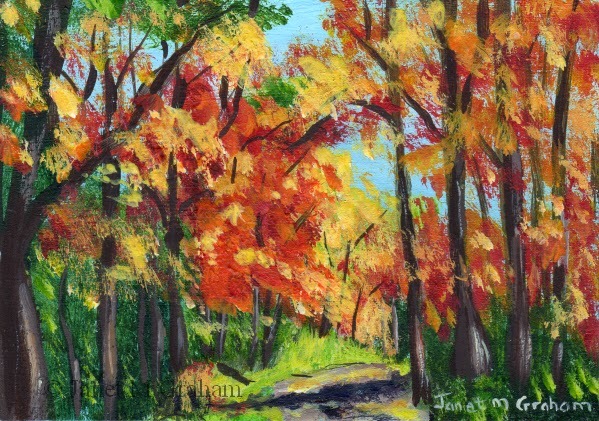 So this one is the second Autumn landscape I painted. I enjoyed painting it and am rather pleased how it turned out. Autumn Pathway measures 3.5 x 2.5 inches and is painted on 300gsm smooth watercolour paper. I haven't painted the little landscape aceo's for ages and since it is autumn, I decided to paint a couple of Autumn Landscapes. This is the first one. 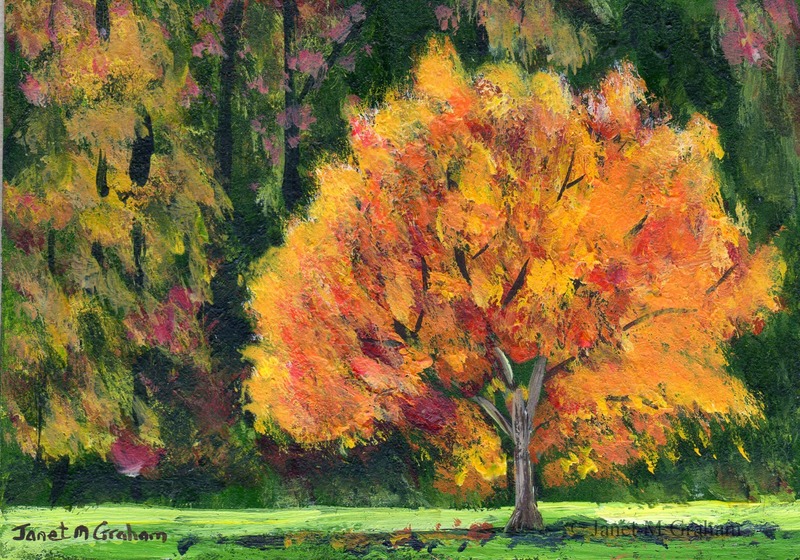 I just love the tree in all its autumn splendour and it was really fun to paint too. Autumn Tree measures 3.5 x 2.5 inches and is painted on 300gsm smooth Arches watercolour paper. Many thanks to E. Luiza Picciano for the reference photo. I love the vibrancy of this bird's feathers. It was a bit of a balancing act to lighten the feathers without turning them pink. I also thought the bird wasn't standing out enough from the background so I ended up darkening the background and I am really happy how it turned out in the end. Red Bishops (also known as Southern Red Bishops) are found in Africa South of the Equator. 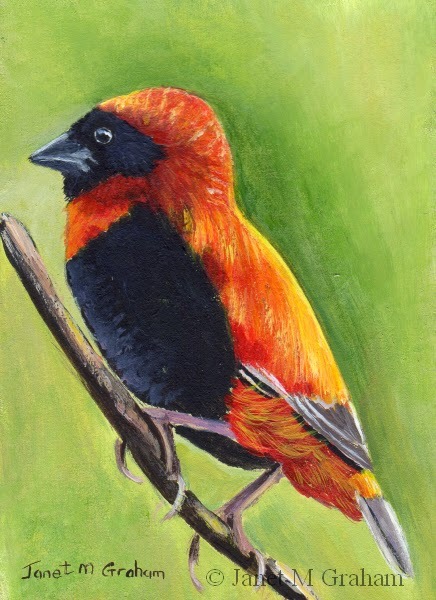 Red Bishop measures 2.5 x 3.5 inches and is painted on 300gsm smooth Arches watercolour paper. I was very excited to be ask to be this weeks featured artist on Daily Paintworks. The link to the interview is http://dpwnews.blogspot.com/2014/03/dpw-spotlight-interview-janet-graham.html. It is a week long feature so I will be posting a few larger paintings for auction during the week and I will blog about them when I list them. I find these birds markings so interesting. 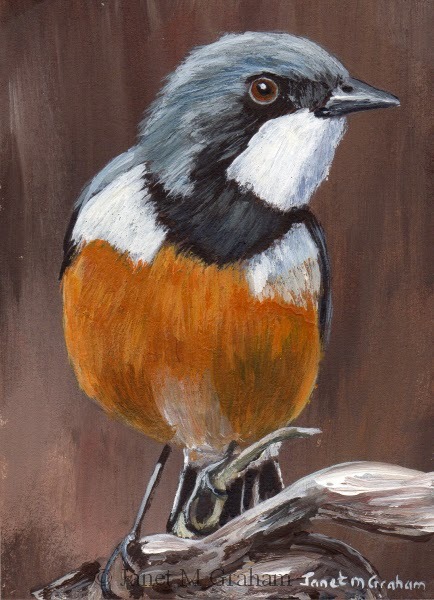 I decided to paint it in a larger format this time as I have already painted an ACEO version. I went for a more neutral background which I think works really well as the bird then stands out from the background. Zebra Finches range from 10 - 12 cm in length and weigh around 12 grams. 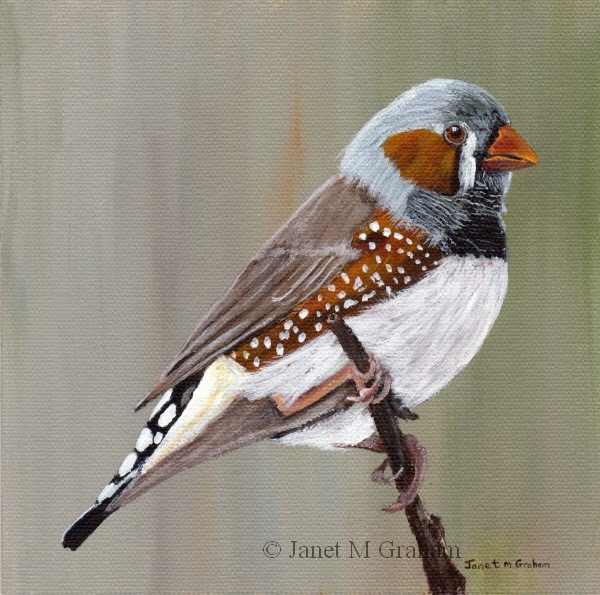 Zebra Finch measures 6 x 6 inches and is painted on Raymar's Feather Light Smooth Portrait Cotton 1/16" panel. I love the intensity of this lions eyes. I started off with a Burnt Umber/ Raw Sienna background which worked rather as the base colour for the lions fur. I am planning on painting some more lions. I took some photos of white lions including some very adorable cubs when visiting Tasmania last year. They are on my growing list of paintings to do - my list is up to around the 30 mark now and I keep adding to it but I will eventually get around to painting them. 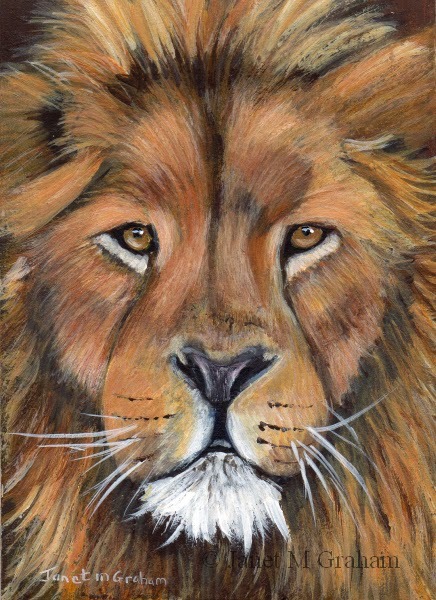 Lion measures 2.5 x 3.5 inches and is painted on 300gsm Smooth Arches Watercolour paper. I love the position this robin is sitting on the branch. I played around a bit with mixing the grey feather colours - ended up using mixtures / combinations of Phthalo Blue / Ultramarine Blue / transparent yellow / Permanent Alizarin / Burnt Umber + white - the combinations created some rather lovely greys. Eastern Yellow Robins are rather inquisitive and confident around us and have been known to take handouts of food from picnickers. 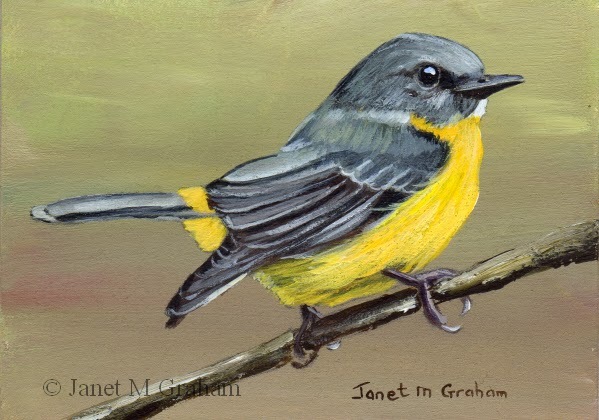 Eastern Yellow Robin measures 3.5 x 2.5 inches and is painted on 300gsm smooth Arches Watercolour paper. I have wanted to paint this bird for a while. I just love its colouring. I mixed Crimson, a touch of ultramarine blue, transparent yellow and white to created the rose / pinkish coloured feathers. Really pleased with the final result. The Bullfinch breeds across Europe and temperate Asia. They are around 14 - 16 cm in length and weigh between 27 - 38 grams. 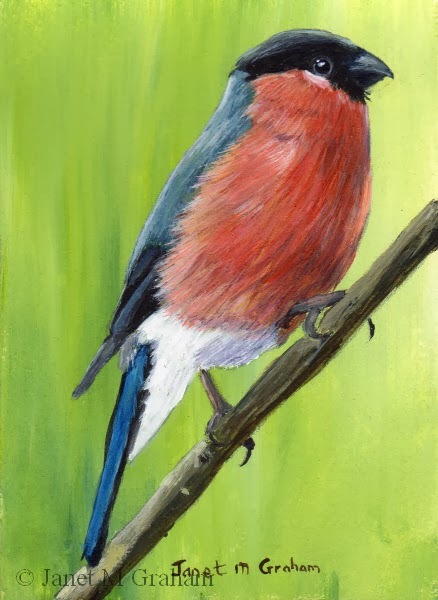 Bullfinch measures 2.5 x 3.5 inches and is painted on 300gsm smooth Arches watercolour paper. This one was a bit difficult to paint. To lighten red is always a bit of a challenge but I got there in the end. These bird breeding habitat is in Canada and North Eastern United States as well as along the US Pacific coast. They measure around 15 cm in length and weight around 34 grams. 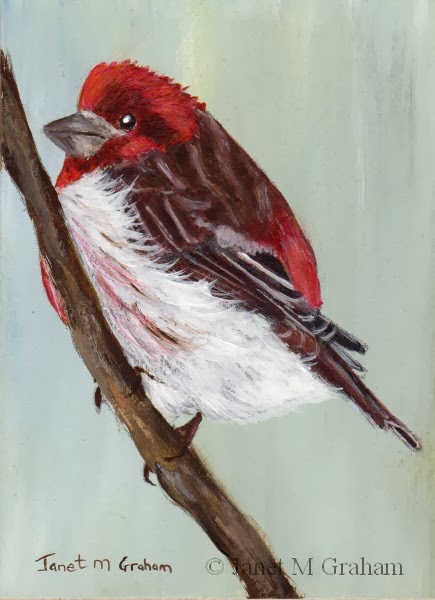 Purple Finch measures 2.5 x 3.5 inches and is painted on 300gsm smooth Arches watercolour paper. I am really pleased how this one turned out. Love how the bird stands out from the tree trunk. Used an old bristle brush to paint the texture of the tree - worked rather well. These birds are China, Taiwan, India, Laos, Myanmar, Thailand and Vietnam. They are a member of the Old World Flycatcher family and measure around 16cm. 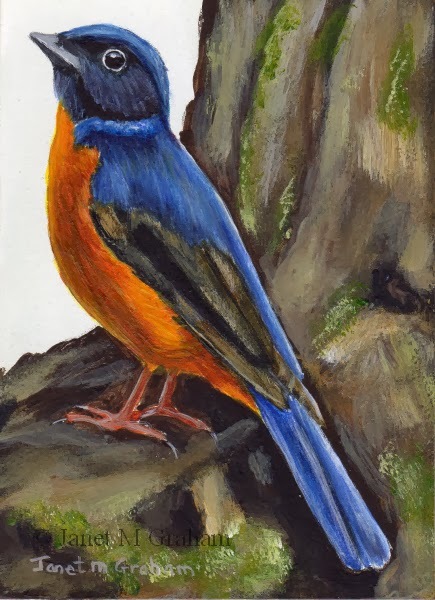 Vivid Niltava measures 2.5 x 3.5 inches and is painted on 300gsm smooth Arches watercolour paper.